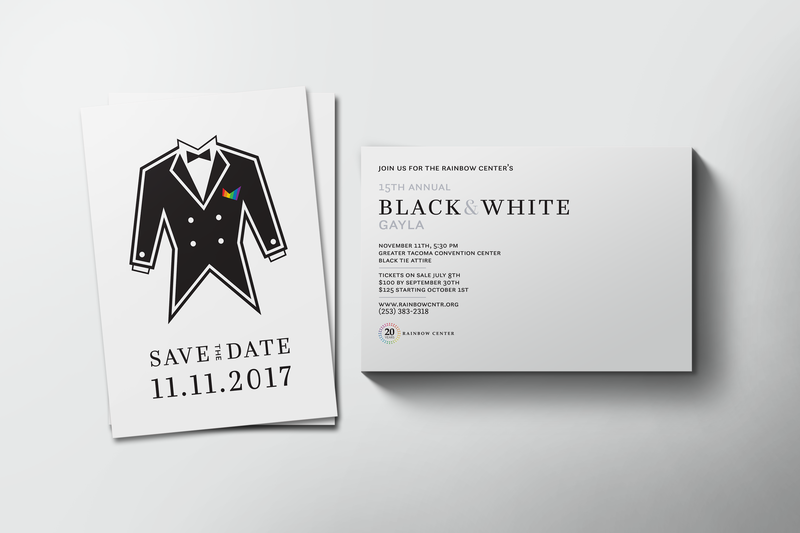 Several pieces designed for the Rainbow Center’s 15th Annual Black & White. In honor of the Rainbow Center’s 20th anniversary, the Gayla went back to its roots as an ultra formal black tie event. As such the designs for this year focused on simplicity and elegance. The tuxedo jacket was a rework of the design from the 2nd Annual Black & White Gayla. One of the reworks included adding a rainbow pocket square. In addition, because the Gayla took place on Veterans Day, a yellow ribbon was added to the lapel. Designed to both be a promotional handout and to be sent through the mail. In an effort to be conscientious of cost to the RC the card was designed to be as large as possible without requiring additional postage when sent through USPS.